O.M.G. Featured in Money Magazine & The Washington Post! “The big challenge of our day, as it relates to the financial security of young people, is getting them thinking about their financial future now while they have 40 or 50 years to let their savings compound. Young people need to protect their identity and their credit score—two relatively recent considerations. Many of them are also committed to making a difference through giving, which is an uplifting trait of younger generations. Yet they are prone to scams and don’t know how to vet a charity. 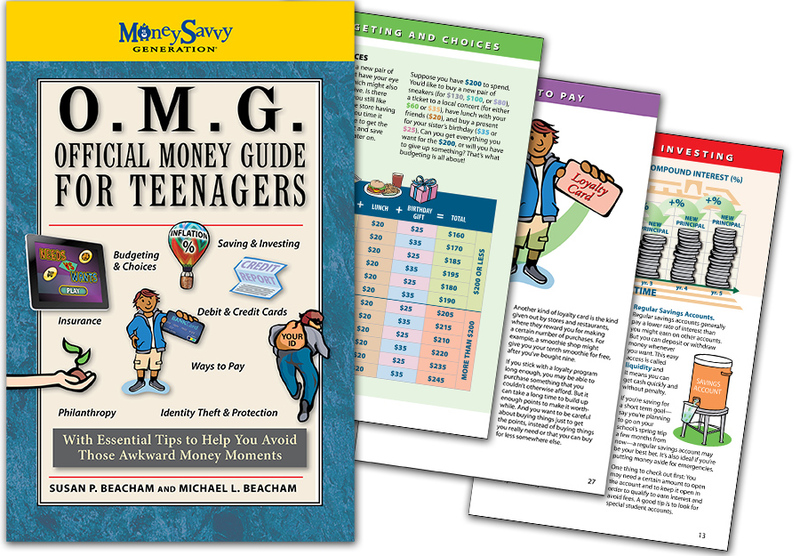 In OMG: The Official Money Guide for Teenagers, authors Susan and Michael Beacham tackle these and other basics in a breezy, colorful, cleverly illustrated booklet meant to hold a teen’s attention.” – Trouble Talking with Your Kids? Try This Book – Money Magazine/TIME by Dan Kadlec. “I could see you giving this 48-page book [to your teen] and then talking through some of the topics covered – good budgeting choices, how to handle credit cards, and the importance of charitable giving. Upon receiving the book, your child may roll her eyes – my 14-year-old did – but don’t be daunted. It did result in a discussion about why she needed to know how to handle her money before bad habits could sink in.” – For daring gift-givers, these books are worth a look – The Washington Post by Michelle Singletary. If you’re ready to get your teen started, here’s a link to order the book before the New Year: O.M.G. book page on msgen.com. Plus, we also have a Teen Bundle available which includes some tools to use along with the O.M.G. book. For an incentive, offer your teen something after completing each of the chapters like a gift card for completing the “ways to pay” chapter or cash for reading the “budgeting” chapter and help them set up their own budget for the cash incentive. It may spark a conversation that surprises you both! Join the Money Savvy Kids Book Club – and Win!